This feed contains high quality protein, high levels of minerals, trace minerals, vitamins and the best combination of energy sources, including cereals, fibre and cold pressed Canola Oil, to provide consistent growth and development. It is a palatable mix for broodmares during pregnancy and lactation. This stud feed is also ideal for feeding to other stud animals, providing ample nutrients for working stallions and growing young stock. This stud feed was originally formulated for the Robertson Area, in the Western Cape, and proved to be so successful that many breeders currently use it across the country. This ration contains higher levels of lysine and methionine to comply with the additional demands of reproduction (lactation) and growth in young horses. It also contains a variety of minerals and vitamins for development of strong bones and hooves. The selenium, zinc, copper, manganese, vitamin E and A improve fertility in breeding mares and spermatogenesis in stallions. In addition the Robertson Stud Feed 15% contains live yeast culture to sustain and enhance colonisation of micro organisms in the hind gut for better digestion, absorption and general gut health. It also contains a mycotoxin binder. 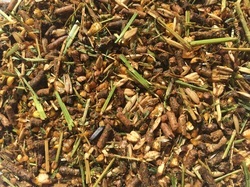 Feed dry mares 2 - 3 kg, pregnant mares 3 - 4 kg, lactating mares 6 - 8 kg, yearlings 4 - 6 kg daily according to body weight, condition, reproduction stage and growth rate, with ad lib good quality roughage.